Human Hamster Ball, Giant Human Hamster Ball, Human Hamster Ball for Sale, is an extreme sporting adventure, named Inflatable Zorbing Balls as well, fairly fashionable and popular in modern entertainment for kids and adults by being rolled down slopes, ramps or walking and riding on grassplot, snowfield, beach, zorbing track, orbit and pool etc. It is a must to confirm zorbing balls conditions fine before playing and to take care of the safety with harnesses well inside, or tying the handle outside on the zorbing to something fixed with a rope. Then just walk, ride or run it, or stay rolling with the Zorb Balls Giant Human Hamster Ball, you will feel spinned around in so much fun! 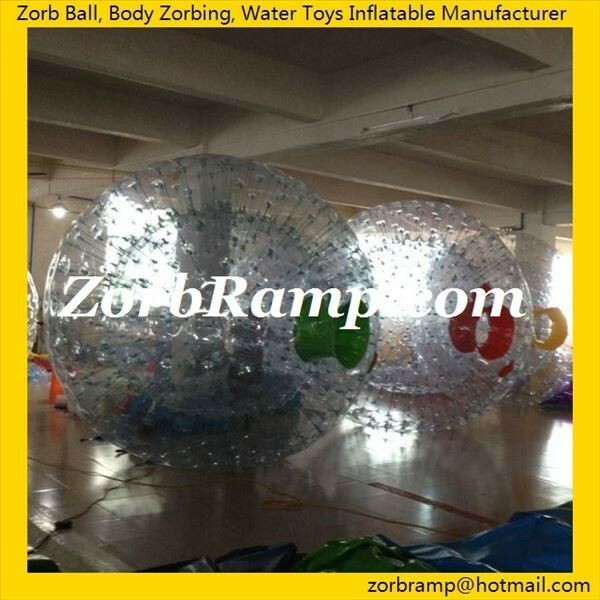 Do you want to try Zorbing Ball Human Hamster Ball for Sale from China? Don't hesitate to email us, good Zorbing Balls to Buy is just over here! Human Hamster Ball - Want to Buy with us?